Amla oil is a natural substance often used to promote hair health. Sourced from the Indian gooseberry fruit (also known as Emblica officinalis or Phyllanthus emblica), the oil is said to fight hair loss, stimulate hair growth, and prevent prematurely gray hair. When used as a hair treatment, amla oil is typically applied directly to the scalp or to facial hair such as the beard or eyebrows. Long used in Ayurveda, amla oil is traditionally made by immersing dried amla fruit in oil. Coconut oil, mineral oil, or sesame oil are often used as the base oil. After a few days of oil immersion, the fruit is removed and the oil is filtered and purified. Other ingredients may be added (such as preservatives or scents). Featuring a number of fatty acids, amla oil is thought to strengthen hair follicles and condition hair. Proponents also claim that amla oil can promote hair growth and help treat dry, itchy scalp and dandruff. 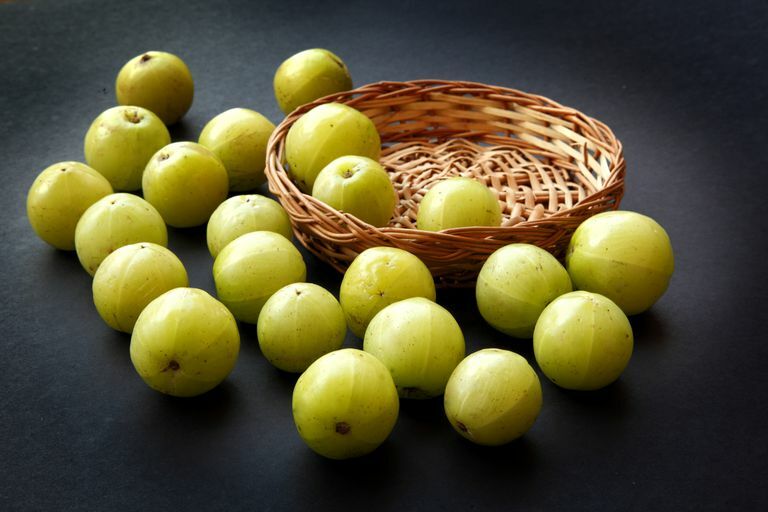 Besides fatty acids, amla fruit is high in vitamin C, flavonoids, polyphenols, and also contains water, protein, carbohydrates, vitamins, and minerals. Although amla oil has a long history of use as a hair treatment, there is very little scientific evidence for its effectiveness as a treatment for hair loss, prematurely white or gray hair, or scalp-related health problems such as dandruff. The available research includes a preliminary study published in the Journal of Ethnopharmacology in 2012. In this animal study, researchers tested 17 plants grown in Thailand, including amla extract. They found that amla was the second most potent inhibitor of 5-alpha reductase (the oral medication finasteride, used for the treatment of male pattern hair loss, works by inhibiting 5-alpha reductase). Amla oil is often applied after shampooing and used in place of a conditioner. When used in this manner, amla oil is typically massaged into the strands so that it lightly coats hair. People with oily hair may wish to avoid the scalp and apply the oil to their ends. After 15 minutes or longer, the amla oil can be thoroughly rinsed from the hair with warm water. According to Ayurvedic practitioners, applying amla oil to the scalp can help with dandruff or soothe a dry, itchy scalp. The oil is massaged into the scalp daily and rinsed out after 15 minutes, or it can be left on the scalp overnight before being washed out. Pillows should be covered with old towels or a shower cap worn to prevent the oil from staining. Amla oil can have a strong, musky smell, so it may not be suitable as a leave-in conditioner or styling product unless used very sparingly. Although the pure oil is commonly used as a hair treatment, amla oil is also featured as an ingredient in shampoos. In addition, amla extract is available as an ingredient in a variety of hair powders. Some people also create their own hair treatments by combining amla powder with warm water so that the blend achieves a paste-like consistency. When applied to dry, clean hair as a hair treatment, this mixture is thought to increase hair's softness and thickness. There is a lack of research on the safety of long-term or prolonged use of amla oil. Side effects can include skin irritation and allergy. A patch test is recommended before using amla oil. According to a report, amla oil use has been associated with a rare skin condition known as lichen planus pigmentosus. Avoid getting amla oil in your eyes. Using the oil in the shower or bath can make the shower or tub floor slippery. Caution should be used to prevent falls. ﻿It's important to keep in mind that supplements haven't been tested for safety and dietary supplements are largely unregulated. In some cases, the product may be contaminated. While consumers face such risks when purchasing any supplement, these risks may be of greater magnitude in the purchase of Ayurvedic products. Widely available for purchase online, amla oil is sold in many natural-foods stores and in stores specializing in Ayurvedic products. Like many oils that are applied topically to hair (like argan oil and coconut oil), using a little amla oil on your hair may help to moisturize and smooth dry or frizzy hair. Although amla oil is sometimes said to encourage hair growth, there is a lack of evidence supporting this claim. Kumar N, Rungseevijitprapa W, Narkkhong NA, Suttajit M, Chaiyasut C. 5α-reductase inhibition and hair growth promotion of some Thai plants traditionally used for hair treatment. J Ethnopharmacol. 2012 Feb 15;139(3):765-71. Yang G, Tan C. Lichen Planus Pigmentosus-like Reaction to Guasha. J Cutan Med Surg. 2016 Nov;20(6):586-588. Can Tamanu Oil Soothe Your Skin and Promote Healing? Is Lemon Eucalyptus Oil Nature's Best Insect Repellent?